The Nike Epic React Flyknit was a comfortable shoe right out of the box, several users exclaimed. Other runners expressed how comfortable the shoe is: some compared it to running on pillows and clouds, while another voiced comfort even on the knees. The outsole was surprisingly durable, wrote a commenter. The lightweight disposition helped increase running speed, a couple of reviewers observed. A lot of wearers said that the Epic React Flyknit was a good-looking shoe. Some runners were pleased with how responsive the midsole was. One tester liked that the Flyknit upper was snug and structured. There was just the right amount of cushioning: not too soft and not too firm, explained a reviewer. The shoe allowed natural movement, even during fast-paced activities, commended a buyer. The Epic React Flyknit was an excellent shoe for up-tempo days and speedy runs, a reviewer claimed. The shoe had a narrow fit, according to a couple of purchasers. Several customers experienced a weird popping noise from the shoe that was quite bothersome. Not much support for midfoot strikers, a disappointed user stated. Although lightweight, the shoe’s structure made it look bulky, a reviewer thought. Some users disliked that the shoe required a break-in period. A bit tight around the forefoot, according to numerous customers. 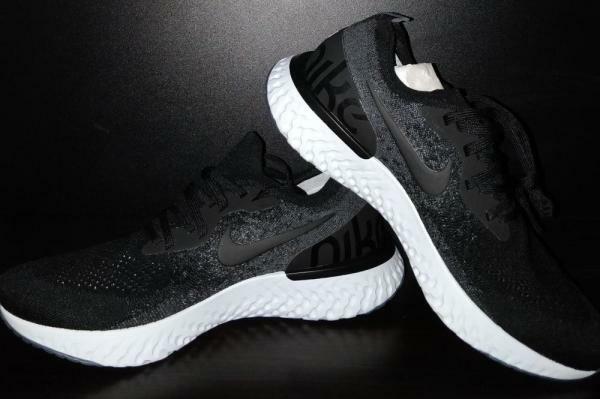 The Epic React Flyknit did not have a lot of grip on indoor surfaces, said a runner. The heel counter was too rigid, especially during the first few wears, a wearer mentioned. The Nike Epic React Flyknit seemed to be a successful release, but not quite. Although many runners praised the shoe’s comfort level, durability, and weight, there were some who were dissatisfied with the fit and support. In terms of performance, the shoe received both raves and rants. Thus, it could be said that the Epic React Flyknit is an average running shoe; not perfect, but worth a try and worth the investment. I must admit, Nike and I haven't seen eye to eye for some time. Despite having purchased a couple of models very early on as a casual runner, I have not owned a pair of Nike in the last 10 years. The only pair which I did like and kind of want, was the original Flyknit Racer when released 6 years ago. The high price tag, however, was just one of the things that got in the way. You see, in my eyes, Nike had an image problem. With their emphasis on marketing and lifestyle, along with the controversial use of sweatshops and continued support of athletes charged with doping, it was all too easy for me to dismiss the brand in favor of those perceived more "runner-centric" such as Brooks, New Balance, and Asics. As a runner, I wanted running shoes, not lifestyle products. Well-publicized "stunts" such as the sub-2 hour marathon attempt didn’t help. But, beneath all that, I also knew there was also proper innovation and technology at work. The eye-opening first encounter with the original Flyknit, the marvelous barefoot feel of the minimal Free series, and the buzz – from real runners – surrounding VaporFly 4% were all testament to that. So here I found myself with Nike's latest "hype-able" offering in my hands – the RunRepeat in partnership with Nike. Here is probably a good place to briefly set out my own definition of what makes a runner "casual" and another "serious," reasons for the distinction which will become clear later. In my eyes, one is a casual runner if one runs mainly for enjoyment and for the benefits it brings to the body and soul. A casual runner "runs to eat" (i.e. cake without the guilt). A runner becomes more serious when mental and physical boundaries are pushed. A serious runner eats – discerningly - in order to run better. A relevant observation as a running shoe geek: a casual runner will probably if they enter races at all, race in the same daily trainer that they use for everyday runs. A serious runner, on the other hand, is likely to have a set of racing flats specific to the distance being raced. It is entirely possible for one person to be both casual and serious, depending on where they are in fitness and training. And, importantly, one is not better than the other. My thesis is that Epic React is indeed a serious running shoe (as opposed to a lifestyle sneaker) but best suited for the casual runner. Read on and see if you agree. When ordering online I went for the usual US10.5 (UK9.5, EUR44.5). After placing the order, however, I saw the words on the official website; "Fits true to size for a snug fit. If you prefer a slightly bigger fit, we recommend ordering a ½ size up." Oops. Having slightly wider feet than most, I now faced a nervous wait. Once the shoes arrived and I pulled them on, I feared that they were indeed half size too small. The length seemed OK, as was room in the forefoot, with some wriggle room left for my toes. But the squeeze on the midfoot was crazy, to the point that I almost decided that I couldn’t possibly run in these. And then I remembered back to that time many moons ago when I was trialing the first Flyknit and how the Nike rep had gone through the "performance" of steaming the upper and molding them to my feet. I decided to trust the Flyknit's ability to stretch and adapt and hoped that a couple of sweaty runs would do their magic in breaking the shoes in. To be honest, I actually wasn’t thinking I would be running much in these, at least not yet. While Nike's formidable design team has delivered yet again, in my mind I was thinking "summer," "shorts," "casual." True to preconceptions these looked like lifestyle sneakers designed seemingly to be walked around town in and if they performed half decently as running shoes, well, that would be a bonus. The design strikes the right balance of subtle and contrast. I loved the College Navy colorway, what with its blue-ish white midsole, pink heel stabilizer, and yellow pull tab all coming together into something very easy on the eye. Even the heel offset, while unusual and odd, did not detract from the overall look. A quick glance at most other Nike models suggests the flanged heel is a brand feature anyway. The offset heel is just an extreme variation on the theme. The "tongue" is integrated into the Flyknit upper, adding to the minimal feel. Given the tightness around midfoot, however, laces almost seemed unnecessary and left there only for aesthetics. Or perhaps necessary only for those who had elected for a looser fit and sized up. A further reason for delaying my run in these was that, with the UK still firmly in Winter's grip, it was almost too cold to be wearing such airy shoes. The Flyknit upper, while denser midfoot and towards the midsole, were very "breathable" around the toes to the point that one can discern the color of the socks. To be sure, much of the hype surrounding the shoe was centered on React, the new proprietary high energy return midsole material for Nike. Not only high energy return, but incredibly light, and long-lasting, to boot. Time would tell with regards to the other claims, but one thing is certain right out of the box – the shoes are remarkably light. The shoes weigh in at 239gr for size 9 and carry a 10mm offset. The stack height is considerable, at 18mm-28mm. Adidas Ultra Boost, on the other hand, is heavier at 303gr while lower profile at 12mm-22mm. According to Nike, the React foam, which is a rubber based rather than EVA based, is more responsive and durable than their own Lunar foam, while delivering 13% more energy return. While I have no first-hand experience of the Lunar, comparison with Ultra Boost suggests the Boost is a heavier, denser material. At any rate, as always, the proof is in the ride. Winter or not, heeding to my task at hand to review the shoes in a timely manner, donning my thinnest pair of socks, I set off on a maiden 10 mile run in the Epic React. The run was actually one of my social beer runs, involving a 6-mile jog to a designated pub, from where the group would engage in a speed session in the nearby park, returning to the pub for beers. The point is that the run would involve various paces and intensities, providing useful feedback. I was also mindful of a half marathon coming up and unless convinced otherwise before then, Epic React would be carrying me on race day. I was pleasantly surprised by the shoes. "React" is an appropriate name for the midsole material, since it seemed to provide ample energy return, yet with both cushioning and responsiveness which in so many shoes are mutually exclusive. I bounced along comfortably at slower paces and powered through higher speeds. At higher speeds, particularly when cornering, I was actually grateful for the snug fit. With a looser fit, given the stretchiness of the upper, I had visions of the midfoot spilling out over the midsole. The shoes are notably narrow midfoot, and the relatively high stack height added to the sense of instability during tight turns. But over this and couple of other subsequent runs, there was nothing to suggest otherwise so Epic React was my choice for the London Landmarks Half Marathon, where I had the responsibility of pacing the 1hr 45mins group. Now, target time of 1hr 45mins is more than 10 minutes outside of my PB so I wouldn’t be going all-out, but it was still pacey enough to make it a decent morning's workout! Pacing a race can be fairly stressful, what with having to keep an eye on your GPS watch, another on the mile markers along the route - and the two giving you wildly differing information - all the while wearing a back-pack with a large sail-like flag with target time on it so other runners can easily spot who to follow. It is also an incredibly rewarding experience, as you get to encourage and otherwise help other runners meet their target times and indeed get over the finish line. So, I suppose it is to Epic React's credit that the shoe was the last thing I had to think or worry about on race day, as I managed to bring runners home in 1hr 44mins 30secs! 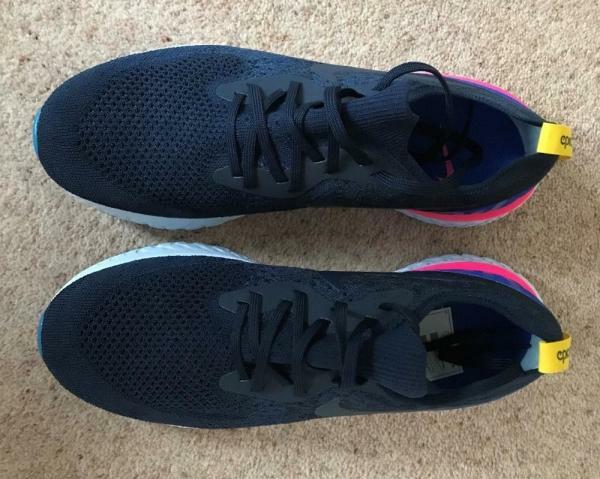 The shoes were comfortable before, during, and after as I negotiated the streets of London and I'd add that, as racing shoes, the half marathon may be the ideal distance for Epic React, but I have no doubt they'd prove just as comfortable over a full marathon too. The shoes were fine on wet surfaces, although not as reassuring as the Continental outsole on Adidas. But then again, in my experience, nothing surpasses Continental rubber in the wet. Ironically, the exposed midsole seemed to provide more traction on wet tarmac than the rubberized toe and heel. I was pleasantly surprised by the Nike Epic React. While React foam is not the game changer some would have believed, it does provide excellent energy return which comes through in a cushioned and responsive ride that indeed makes running fun, particularly at slower speeds. The shoe design, material, and production are executed to perfection and the shoe is versatile in the sense that it looks at home in both casual and race setting. The ample cushioning in the rear half also makes them great for walking in, probably the most comfortable amongst all my other running shoes, so they actually work as lifestyle shoes too. If to be worn primarily as a lifestyle shoe, I would probably size up by half to accommodate thicker socks and since comfort rather than performance is more important. If to be used primarily for running and racing, I'd be happy to stick to the usual size to get the benefits of foot-hugging fit. Having run in them about a dozen times, the shoes still require a bit of foot contortion to pull on but, once on, there is plenty of room in the forefoot and no discernible discomfort anywhere. The only flaw I can think of is the narrowness of the midsole at midfoot which, combined with the stack height, takes away the stability somewhat on uneven ground and while cornering at speed. As serious running shoes, Epic React has a place as daily and primary running shoes for serious and casual runners alike and for racing 10km up to marathon distances for the casual runner. The ride feels consistent and smooth at all paces, but excel during the slower jogs, when one is more likely to land on the mid to rear foot. For the serious PB chasers in shorter distances, however, Epic React is no match for racing flats. But, to be fair, that isn't what the shoes were designed for. After almost 80 miles, the sole is showing some but surprisingly little wear. As is often the case with running shoes, I reckon the outsole will out-last the uppers here. All in all, the experience with Epic React has both reinforced my views towards Nike and shed new light. The brand does indeed cater to both lifestyle and serious running but with Epic React succeeds in scoring on both counts thanks to great design and materials. Epic React is a serious running shoe first and foremost and that it can also be worn casually is a bonus. I am now looking for the next pair of Nike to try. Now, that's progress! Check out the Nike Epic React Flyknit at Nike.com! Nike Epic React: Epic success or epic fail? 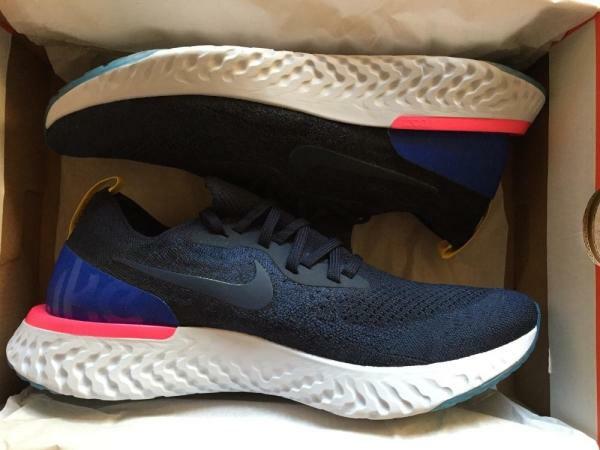 I knew there was a lot of fanfare around the Nike Epic React Flyknit but I really did not know too much about them when I heard I was going to get a pair to test. Once I found out they were on their way I looked into them a bit more and could tell they were set to be something special. So when they arrived on the launch date 22nd February I could not wait to get a peek at them. Now it is fair to say that looks wise they did not disappoint. In my opinion, they look stunning. The front of the upper is fairly plain but I Iove the sole and the back of the shoe. The pink band around the back of the sole looks awesome and matches the other colors beautifully. This is the best looking back of a shoe I have seen and trust me, they look even better in the flesh. All this makes perfect sense to me as the Epic Reacts feel so light and fast this the view most other runners are going to be seeing a lot of. The sole looks fantastic too. It reminds me of a glacier, with ice blue patches over the heel and toe much like the boreholes you see on icesheets. I was impressed before I had even put them on my feet. The Epic Reacts consist of an upper that is basically a single piece of flyknit like a low sock. There is not really a tongue as such just a tab attached to the front of the sock. There is no padding but this is not a problem. There is not much else on top but my feet felt secure and supported. The laces are probably the only average thing about the shoes. I’d prefer something with a bit more friction to stop them coming undone but they do the job just fine. Given that the upper is basically a sock, you don’t need to worry about the lacing as you would in a conventional shoe so top notch laces and lacing techniques are not really needed. When you first put them on, they feel cosseting without being too tight as you sometimes get from new sock-like shoes. They feel light and airy and comfortable straight away. The size is just as I would expect and as with all other Nike shoes, I’d stick to my normal 10.5. The soles are definitely chunkier than other Nike trainers I have trained. There is a hint of Hoka One-One here but they still feel light and responsive. There's lots of cushioning and the energy return is as good as anything I have tried from Adidas. I used to think shoes could either be cushioned so you could plod around and avoid aching feet or fast and responsive yet suffer later on. The Epic Reacts prove that the game has changed and you can now have the best of both worlds. So far so very, very good. No wonder they are pretty much sold out already. I have already mentioned the ice cool design of the soles. This is not all show and no go as the pale blue parts are made of some special material that is attached to the main sole. The material looks to be very hard wearing. If you are a heel and toe striker these should last for ages. You could question why the whole sole is not covered in the blue material for increased longevity but at the moment that is a small gripe. Grip is fine. The soles don’t look like they are going to provide excellent traction but so far I have had no problems on damp pavements. The soles feel a lot wider than the uppers which I like. Even though these are not really support shoes, they gave me confidence that I was not going to go over on my ankle if the surface was less than perfect or when taking tight turns. This may all be psychological but it was a feeling I appreciated. The Epic Reacts are fast and comfortable. They feel light and springy and encourage a high cadence throughout your run. I would be happy to use these for any road runs from 5k to a half marathon though I have only done a few short runs so far. The soles feel soft without being spongy, giving you enough feedback to savor every step. A hard balance to get right but Nike seems to have managed it. First impressions suggest Nike have made a do it all running shoe. No doubt in my mind, the Nike Epic React Flyknit looks amazing, especially from the back. They are genuinely different to anything I have ever owned and people notice them. I know it should be all about comfort and performance but why can’t we have form and function now and again? Their performance more than matches their appearance. They feel fast. The kind of shoe that you take out on a route you have covered hundreds of times and by the end of the run, checking your watch provides a pleasant surprise. It didn’t feel super fast but it was. The new foam in the sole is a revelation. The cushioning is superb and even over long runs, there were no aches in my feet or a feeling of heavy legs. I have had a couple of pairs of Nike Lunar Epics which I am a big fan but the Epic Reacts are a massive step forward. My only wish is for Nike to launch a Shield version so I can wear them all year around. Check out the Nike Epic React Flyknit at Nike.com. Nike Epic React Flyknit: Running on clouds? I bought the Nike Epic React Flyknit due to its strong advertisement over cushioning and responsiveness all together in a lightweight shoe. So after a couple of months let`s review it! I usually go for darker colors so once again I got the blackest one but there are other more colored ones like orange, grey, and green. Even though it’s a “high tech” shoe, I think it missed some more sleek details to balance out its dark black design. For the first time, I had a Nike shoe that I almost cannot see the Nike logo, and I still cannot say if it`s good or not. My only warning here is that you are probably going to prefer this shoe 1 size bigger than your standard size. For the upper, Flyknit technology reinforces the protection of the toebox all the way to the edges of the shoe. It offers good breathability and in terms of durability, it’s also proven to work. And in case you are wondering, yes, I wore it without shoelaces, they are simply useless with this kind of shoe. Nike advertised that their “React” foam is the best of the market, with better responsiveness when compared to “Lunar” foam by 13%, as well as lighter and softer altogether. And yes, they did it again. Lightweight and responsiveness is a major plus here. I managed to actually increase my average running speed for around 10%. Look how thick the midsole is, almost as big as the shoe itself, and lightweight at the same time – see Weight section right below. The only remark is that when you actually wear the shoe, you can feel it’s different from a standard cushion you may be used to, and it is, it`s a Nike exclusive technology. Therefore, you may need a couple of runs to get used to it. Also because of its higher midsole, you will also need to be more careful regarding stability, which we will talk more about it later on. To conclude, I would say that “React” really provides a groundbreaking cushion scheme here, a big plus for Nike. I cannot believe how light this shoe is! Despite its cushion, Nike managed to build a solid well-constructed and responsive lightweight shoe. Each pair (US Size 11) weights 251 grams. As a comparison, my Asics weights more than 400g while my other Nikes (Vomero/Pegasus) 340. I would say it’s the best cushion-weight balance out there. Another big plus for Nike here. As similar to Adidas Ultraboost, Nike had to reduce the ankle support in order to provide a “sock feeling”, as a result, stability was compromised. The only stability is a thin easily folded layer of material, and together with a high midsole, enhances the possibility of a twisted ankle. For that, I give a big minus since as its already a very lightweight shoe, Nike could have done better here without compromising its overall weight. Generally speaking, Nike shoes are mainly asphalt shoes with rubber soles, but in this case, I felt they went one step further. 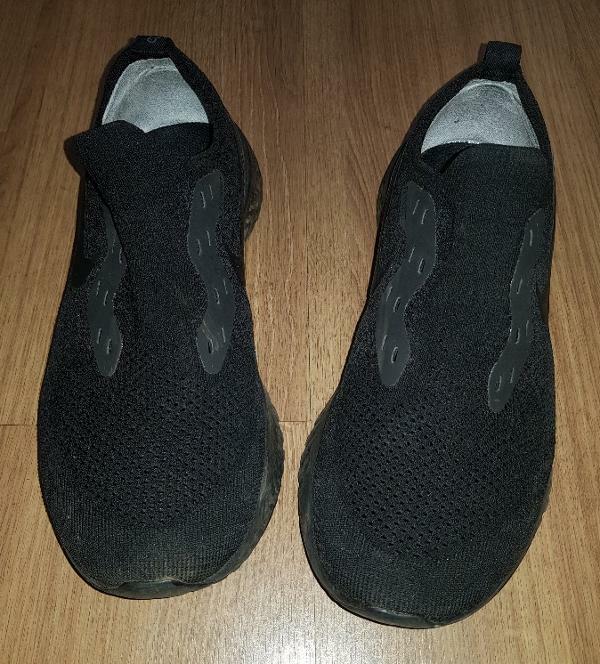 As you can see from the pics below, there is an additional pneumatic layer of sole both in the front and back of the sole, providing a very good grip, not just on traditional asphalt and running paths but also trails and wet surfaces. Another plus here. My only remark is regarding the durability of this sole since it is very thin. I`ll get back with you, later on, to talk about that. Something else I always like to have on my shoe is an additional safety for night running, and Epic React also has that reflective light on the back. In terms of price, it is definitely not on the entry shoe range, however, when compared to similar shoes like Adidas Ultraboost and Brooks Levitate, its way cheaper, so another good point here. A very important part for me is the impact of exercise on the day after. And with Epic React the results were not straightforward. At first, I experienced knee and muscles sore on the side of the leg, which had me worried. After a couple of runs though, the sore reduced to none, so I probably just needed to get used to the different cushion technology and low level of stability. After a while, I had not noticed shoe specific sore, just regular muscle tiredness. Nike Epic React Flyknit is a long name shoe and they should improve that. Constructively speaking, it is comfortable, is amazingly lightweight cushioned shoe, has good ventilation and is made of high-quality material. I could go one step further and maybe say that Nike almost got it 100% right, missing basically on a more beautiful design and better stability. During first exercises, you may need to get used to its new React cushion technology, but after a while, you feel its great responsiveness even though its lightweight, the best of both worlds. Even though Nike did not provide good stability here, you can take care and bear with it since it worth the advantage of great responsiveness resulting in higher running speed. My tip here is to train with a heavier shoe with better stability and once in a while wear Epic React for performance training. Epic React has few minuses (design/stability) but strong positive points, therefore I totally recommend it. Nike Epic React Flyknit - Truly Epic or Overhyped? The Nike Epic React Flyknit. Even before it came out, there were tons of hype surrounding the shoe. People questioned if this was Nike’s response to the extremely popular Adidas Ultraboost. Nike went with a robust marketing campaign, including heavy advertising of pictures of the shoe on pillows, sponges, and springs. Marketed as ‘incredibly bouncy’, providing ‘crazy comfort’, and a ‘lightweight and soft yet responsive ride, mile after mile’, one can only wonder if the Epic React truly delivers or is built around empty promises and false advertising. Single piece Flyknit construction that provides support, flexibility, and breathability in a sock-like fit. The upper was very very snug when I first put the shoe on. In fact, the shoe was annoyingly difficult to wear. I understand that Flyknit tends to fit more snugly than conventional mesh uppers, but this was a bit too much for my liking. The constrictive feeling, especially in the forefoot region, eventually went away after wearing the shoe for a few casual strolls and runs. Once the upper stretched out, it felt sock-like, except if the sock was thick and stiff. Don’t get me wrong, the Flyknit is comfortable, just not to the extent of the other Flyknit uppers used in the past. The lacing wasn’t great. Sure, the elastic upper holds the foot in place well. There wasn’t any slippage within the shoe and my foot was held down well. However, the laces did not do much to wrap the Flyknit more securely around the foot. I just wished that Nike used the concept used in either the Zoom Fly or Vaporfly that really allowed the laces to pull the upper around your foot like a burrito. The elastic tongue is part of the one-piece construction. Lacing pressure can become a concern due to the lack of padding. As long as your shoelaces aren’t tied too tightly, this should not pose a problem. The heel counter is decently supportive and form fitting, with a synthetic suede heel lining to prevent slippage and blisters. I found no heel slippage at any speeds. A word of caution not to wear the shoe sockless; the ankle collar isn’t exactly the smoothest and may irritate your skin at your Achilles. Also, a heel shelf stabilizes the back of your foot to help keep your heel from rocking as your foot lands. This effectively centres my foot over the midsole to provide a more stable and directed feel. True to size. Do take note of the narrow forefoot fit. After over 400 different combinations of chemistry and processing and 17,000 miles of testing with some of their elite and everyday runners, Nike has come up with the React foam midsole in the Epic React. Every company of late has their own special foam: Flytefoam from Asics, Everun from Saucony, Boost from Adidas, FuelCell from New Balance and DNA AMP from Brooks just to name a few. This React foam, however, differs from the thermoplastic polyurethane (TPU) types that many of the above-mentioned companies are using. Instead, Nike utilizes a synthetic rubber blend that claims to provide softness, responsiveness and long-lasting durability in a lightweight package. Compared to Nike’s other proprietary cushioning, Lunarlon, the React foam claims to have 13% more energy return but yet provides a softer feel underfoot. As a direct comparison to the Nike LunarEpic Flyknit 2, the Nike Epic React Flyknit is ‘5% lighter, 11% softer and provides 10% more energy return’. The React foam lives up to its claims to some extent, providing a decent amount of cushioning and responsiveness for its mere 239grams. The foam is not as spongy as Nike has advertised but feels better than conventional EVA foam. The Flexibility is fair, the bounce is subtle, and the softness is on the moderate side. Compared to Everun, Boost and other Polyurethane (PU) midsole blends, React foam has less of a bounce but weighs much less. I tested the Epic React through a variety of paces, from long runs to speed work on the track. The foam was stable and responsive, especially so when I pushed the pace. The midsole delivered a quick bounce back and did not bottom out. I would, however, caution bringing this shoe to the track for speedwork as transitions aren’t the quickest. I found that the shoe felt best at steady paces of about 4:45-5:15min/km. I read from other reviews that the synthetic rubber foam performed better in warmer temperatures. I wouldn’t be sure about the feel in different temperatures, but the foam was decently soft in a warm Singapore weather of 32 degrees Celsius. The wide forefoot and heel prevent the shoe from having any medial/lateral bias. Also, the heel shelf at the back of the shoe helped to keep my foot centered on the midsole. Despite being supportive, do note that this is very much a neutral shoe and those seeking more stability should look elsewhere. ‘Strategic’ rubber placements in the toe and heel to keep the shoe as light as possible. These rubber sections on the toe and heel supposedly help you grip the ground and push off. React foam covering the rest of the midsole. The rubber placements in the toe make absolutely no sense. No one lands on the toe upon impact. It seems like Nike has rectified the situation in the Odyssey React, a cheaper alternative to the Epic React. I wish Nike placed the outsole rubber in the same configuration as the Zoom Fly. That said, the React foam which covers most of the outsole is grippy on asphalt, concrete and track surfaces. The outsole grip performs decently in mildly wet conditions. As for anything off-road, don’t expect any grip whatsoever. Nike claims to have purposely gone as minimal as possible with outsole rubber coverage to better enhance the feeling of the React foam underfoot. Some scuffing can be seen on the lateral side of the foam. Besides the visible wear on the sole, no loss of cushioning has been felt after more than 100km of multi-paced running. Nike mentioned that the foam should feel the same even after 300miles. The Nike Epic React Flyknit is a lightweight versatile trainer that is best used for tempo runs up to long runs. The Epic React was marketed to be a direct competitor to the Ultraboost. In terms of the upper, the Flyknit of the Epic React has a more secure hold on my foot while the Primeknit of the Ultraboost is softer and looser. The Epic React is more versatile and performance oriented while the Ultraboost is better suited for lifestyle use. Despite the React Midsole being firmer than Boost, I found it better for long runs as it provided more stability. I used to hate Skechers. The GoRun Ride 7 made me change my entire opinion of the brand. The Ride 7 has a softer upper feel and is less constricting at the midfoot compared to the Epic React. Both midsole materials feel very similar with the React midsole being a touch firmer than the Ride 7, making the Epic React better for faster paces. The Epic React is also more stable than the Ride 7. However, I prefer the Ride 7 for easy runs and long runs due to the midsole being more fun to run in at slower paces. ZoomX vs React foam. I Don’t think that this is a fair comparison. The only reason why I wouldn’t use the Vaporfly for everyday use is its lack of durability and its insane price. The React foam feels stiff and dead in comparison. That said, the Epic React will probably last twice as long as the Vaporfly. Epic React for easy and long runs, Zoom Fly for faster paces. Despite the Epic React being lighter by roughly 20grams, the plate in the Zoom Fly facilitates better transitions and speed which allows for a smoother ride in comparison to the Epic React. The React Midsole, however, feels softer and bouncier than the lunarlon midsole in the Zoom Fly. I’m hoping that Nike will eventually release a Zoom Fly 2 which combines the nylon plate with the React Midsole. The Nike Epic React is a good-looking, lightweight and versatile shoe that shines at steady paces. Not a game changer but a refreshing update over Lunarlon! Nike introduces a new foam technology, called the React, in the Nike Epic React Flyknit. This running shoe claims to provide a whole new level of comfort that is long-lasting. Its durable, flexible, and responsive properties make it ideal for road running, casual jogging, and speedwork on the track. Unlike other midsole foams made of ethylene-vinyl acetate (EVA), React is made of a unique rubber that is proprietary to Nike. This material is present in both the midsole and outsole to keep the shoe’s weight at a minimum, but not at the expense of performance. The shoe’s upper is a soft and secure Flyknit material, to give the foot a secure wear that feels as comfortable as a sock. The design maintains simplicity, in order to promote optimal breathability. With a lightweight and seamless construction, the upper offers a precise fit that improves the running experience. The Nike Epic React Flyknit has a standard running shoe length, and it will fit wearers with a narrow to moderate foot volume. The forefoot and midfoot construction allows a snug fit; thus, runners who prefer to have more room might want to purchase a half-size larger than usual. This shoe is available in medium width for both the men’s and women’s versions. The React foam outsole of the Epic React Flyknit aids the midsole in providing a sufficient amount of energy return, as well as additional cushioning for the underfoot. Because it is a foam material, this outsole resists compression and is able to retain its shape, appearance, and structure even after many miles. There are sticky rubber reinforcements strategically placed in the forefoot and heel areas. This is to give the outsole durability and the needed traction to grip various surfaces, especially roads. The midsole also uses React foam. In a nutshell, the development of this technology was the result of runners’ clamor for a shoe that offers the following: increased cushioning to protect from impact, prolonged energy return to handle long runs, lightweight underfoot protection, and durability. The React foam claims to be exceptionally responsive and bouncy. It responds by “snapping back” as a reply to the foot’s impact during landing. Compared to Nike’s other proprietary cushioning, the Lunarlon, the React foam has 13% more energy return. This midsole foam is used in the Epic React Flyknit 2 and other well-known Nike road running shoes. Nike also introduces Fluid Geometry, a technology that works by altering the design of the midsole – it extends to the upper and around the heel to enable stability. With Fluid Geometry, the shoe is made lightweight as the midsole is distributed across the entire shoe. However, the minimal weight does not hinder the shoe from supplying adequate support and responsiveness. Therefore, this feature is present to maximize the runner’s performance. There is an injected heel clip made of thermoplastic urethane (TPU) that equips the shoe with added stability, especially during transitions. The upper’s internal structure is a Flyknit bootie, which consists of a single-piece element, precisely engineered for support and flexibility. With such a construction, the upper is minimal and breathable. It also delivers a sock-like fit, thus ensuring a locked-down feel and a secure run. Because of the bootie construction, the tongue is seamlessly merged with the rest of the upper. Thus, there is no pressure on top of the foot, in contrast to other running shoes with traditional tongues. For an even snugger fit, the heel area has Heel Skin, a thin and pliable structure that supports the heel minus the hard and irritating sensation.